U.S. diplomats fear an increased spread of al-Qaida in North Africa, according to State Department cables recently released by Internet whistleblower Wikileaks. An April 16, 2009, cable from Secretary of State Hillary Clinton's office asked diplomats in North African embassies to investigate al-Qaida "links to weapons of mass destruction or related materials" and the "presence and activities of fighters returning from Iraq and Afghanistan." The document was part of an overall intelligence gathering directive aimed at countering terrorist groups, in particular al-Qaida of the Islamic Maghreb (AQIM). Another cable, concerning a Nov. 27, 2009, meeting held between U.S. Ambassador Gillian Milovanovic; Gen. William (Kip) Ward, head of the U.S. Africa Command; and Malian President Amadou Toumani Toure, also expressed concerns about al-Qaida's North African growth. Toure said "it is not just a matter of destroying a couple of AQIM [al-Qaida of the Islamic Maghreb] bases, we have to be able to hold the territory. The longer the situation drags on, the stronger the Salafists [al-Qaida] will get." The release of the more than 250,000 secret diplomatic cables by Wikileaks has increased the public's ability to see how U.S. officials tried to cope with terror threats. However, they have also revealed national secrets and concerns, including how some Middle Eastern governments have worked with the United States. Clinton's April 16, 2009 cable was directed to embassies and focused in part on expanding information about AQIM. The document with the subject line, "Reporting and Collection Needs: West Africa Sahel Region," went to diplomats in the region comprising Burkina Faso, Cape Verde, Chad, The Gambia, Mali, Mauritania, Niger, and Senegal. It was part of a new State directive to collect more human intelligence throughout the world. 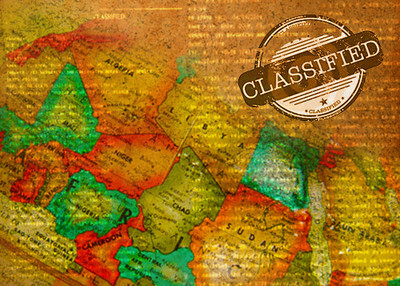 The need for such intelligence has gone up, as AQIM has gained a strategic foothold in the region that covers North and West African nations, collectively referred to as the Sahel. The U.S. embassies in the Sahel region were instructed to investigate AQIM's "links to weapons of mass destruction or related materials," fighters returning from the battlefields of Iraq and Afghanistan, and structural and organizational details, the cable showed. The cable expressed concerns about AQIM's involvement in arms smuggling and the drugs trade, with possible links to Colombian trafficking through the region on its way to Europe. The April 16, 2009, cable also mentioned possible corruption among local government figures in the region and hostage-taking. North African governments bickered as they tried to fight AQIM, a cable between U.S. Ambassador to Algeria David Pierce and the State Department headquarters showed. In an Oct. 19, 2009, meeting with Pierce and Deputy Assistant Secretary of Defense Vicki Huddleston, Algerian Minister Delegate for Defense Abdelmalik Guenaizia blamed "the nexus of arms, drugs, and contraband smuggling in northern Mali [for]creat[ing] an enabling environment" for AQIM. In Mali, however, Malian President Toure told Gen. Ward and U.S. Ambassador Milovanovic that "military cooperation with Algeria is the problem," the Nov. 27, 2009, cable showed. Toure blamed Algeria for not being able to take and hold remote territories in the nation's southern desert. As the situation dragged on, AQIM was making inroads in among disaffected youth and other jihadists, although the Malian population that was "generally reluctant." These concerns came at a time when AQIM was becoming more effective in its attacks. The Oct. 19, 2009, cable from Ambassador to Algeria Pierce to State headquarters noted that Algerian Minister Delegate for Defense Abdelmalik Guenaizia expressed concerns about AQIM's remotely detonated explosives, bomb-making expertise, and sophisticated deployment of attacks. A November 2010 Congressional Research Service report, "Algeria: Current Issues" said AQIM was even responsible for a 2007 assassination attempt on current Algerian President Abdelaziz Bouteflika. The CRS report noted a new terrorism trend that began in 2007, when AQIM began "frequent, 'Iraqi style,' suicide attacks" resulting in mass causalities. Mali and Algeria aren't alone in trying to cope with threats to their national security, the cables released by Wikileaks show. Political Islamists like the Muslim Brotherhood, were also making advances, as Tunisian President Zine El Abidine Ben Ali told Assistant Secretary of State David Welch in the presidential palace in Carthage. Ben Ali told Welch, the March 3, 2008, cable from Ambassador Robert Godec to State headquarters shows, about his concerns for the future of a moderate Islamic Tunisia and the "explosive" situation in the Arab world. Ben Ali, the document shows, said the Muslim Brotherhood would take over Egypt, sooner or later. He talked about the threats to Yemen and Saudi Arabia from their own internal radicals. Ben Ali also expressed concern that Syria was "acting for Iran, and the later is fueling regional problems." Overall, he told Welch, he "does not trust" Shiite Muslims who run Iran. Since the cables from Wikileaks started appearing publicly in late November, they have shown that Ben Ali is not alone among the leaders of Muslim nations who do not trust Iran. For example, Saudi Arabian King Abdullah told U.S. Ambassador to Iraq Ryan Crocker and Gen. David Petraeus that the United States should "cut off the head of the snake" and stop Iran's nuclear program, according to an April 19, 2008 cable.